“Your work is not to drag the world into a new awareness, kicking and screaming. So what is the message of the bee? Above all, bee shows us devotion towards a higher purpose and the magical interconnectedness in all of life. Bee is completely devoted to work for the common good of the hive. This can mirror the commitment we make to our own soul work – the on-going work of healing, transforming, learning and growing towards our higher purpose – Higher Self or spiritual potential. is the greatest service we offer humanity. Find that hard to believe? Over many years, I have observed that my own inner work has extended out to influence those around me in subtle ways – family, animals, partnerships, friends or strangers. 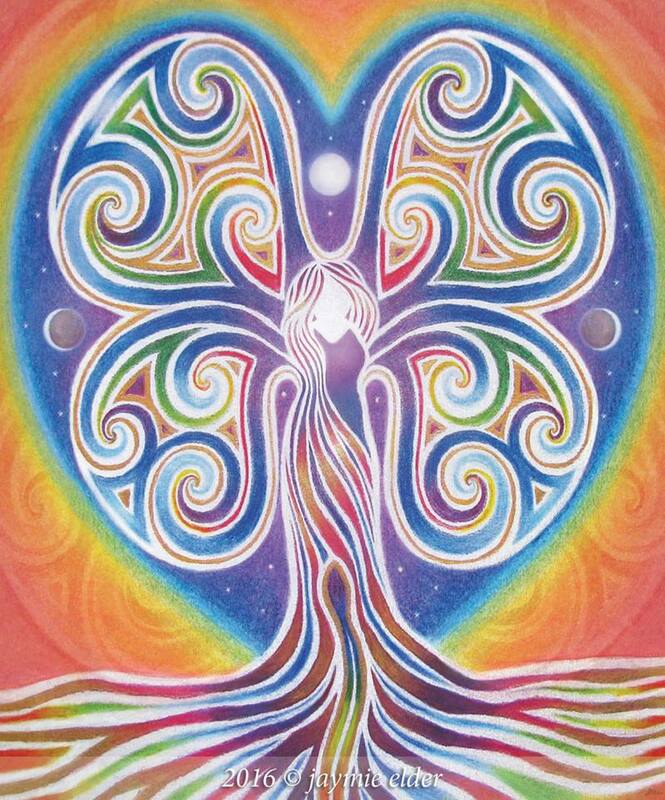 Our soul journey of healing and transformation, is unique to each one of us. As we continue on this journey, we can increasingly recognise the value of our inner work. This work does not require the approval or recognition of others! Perhaps this is the most liberating part about our soul work! …No one else in this world has lived, felt, seen and shared the same experiences as each one of us…No one else walks the same path to know and feel their own divinity – their own Higher Self or spiritual essence. and for our own Soul Journey? The bee is a symbol for soul wisdom. Bee collects pollen from many flowers and turns it into nourishing honey – the gold of bees. Just so, we collect experiences from the many circumstances of our life – painful, loving, challenging and beautiful…and from these experiences we can extract spiritual gold. This spiritual gold is a result of our willingness and courage to be honest and true to ourselves,… to feel deeply into our own wounds – our own patterns, beliefs, masks, our shadow personalities, our hurt inner children – all of which long for the light of our conscious awareness, understanding, love, forgiveness and compassion. Are we devoted to our path of healing (soul work)? In today’s busy world, it is so easy to distract ourselves from facing and owning how we are truly feeling. Just like any form of addiction, we can use social media to instantly distract ourselves from our emotions and feelings. Spending hours online, we can get lost amongst endless information, music, videos, nice photographs, “what we want to see” in order to “feel better“. Or, we may take the anger, frustration or helplessness we feel and project huge amounts of energy into endless arguments with people whom we may never meet in person. These emotions and patterns will always re-surface again and again until we are ready to look at and work with the truth in ourselves. We can try, but in the end we can not hide from the truth. Eventually, when we are ready, our soul calls to us, ….loud enough so that we must pay attention. We grow in love by having the courage to truly face (not turn away) from our uncomfortable emotions i.e. anger, doubt, fear, sadness, jealousy, etc…. We grow in love by being fully present and honest with ourselves and others. It is simple to write about but not easy to practise in all of our relationships, especially with ourselves. those with “eyes to see” and “ears to hear” will respond…. Let us practise being devoted and humble like the bee. Let us start today, in small ways,…becoming more present with our emotions, feelings and allowing our heart to guide us in all our actions. The more we are practising this in our everyday lives, the more we realise that it is our energy that draws people and experiences to us. Rather than judge the experiences as good or bad / right or wrong, we trust and know that somewhere, somehow…. it is for the highest good of our souls evolution. With an open mind and heart, we can ask for our own inner guidance to come forward….we delve deeper for the hidden (shadow) learning, messages and wisdom about our own life and journey, which can be reflected back to us through another person, experience or encounter. This is the way of the spiritual alchemist – the humble yet extraordinary bee – collecting pollen (experience) and transforming it into honey (wisdom). This does not mean we over-analyse situations, experiences and people with our mind. We are inviting the wise, intuitive, feminine or feeling part of our being to come forward and help us to understand, transform, heal and grow. When we look outside for recognition, rewards or approval for our actions our focus is mis-directed. With humility and devotion like the bee, we know that no matter what the outcome, we must keep moving forward on our journey. that they are not ready to receive. But…. never underestimate the power of planting a seed. The more we are being authentically who we are, (less concerned about what others think or say about us or trying to “prove” something to others)…we are vibrating (buzzing 🙂 ) in our core essence. We are touching others with our energy, dispersing seeds of consciousness, love and truth – meanwhile, always continuing with our own soul work. The path from pollen to sweetness honey. And sharpened strength to defend my home. To turn those lessons into nourishment. Bee spirit, I call you. Jaymie Elder is a soul journey guide, artist, photographer and traveller offering intuitive Soul Sessions internationally via Skype. Jaymie is dedicated to supporting others to heal and grow towards their authentic self – and a life in harmony with their heart and soul being. Learn more about Jaymie and her work here. Please share your feedback in the comments below…If you enjoyed this post, please share it, follow my blog or register to receive notifications in your email box for my future posts. Thank you!